Birmingham Moor Street was built initially as an entry into the 2007 DEMU ‘Minories Challenge’ competition, the brief was to build a terminus station with three platform faces on a 7 feet by 1 foot baseboard. The layout represents the terminus side of the station in central Birmingham opened in 1909. The Moor Street terminus handled suburban services to the south of the city, Leamington Spa and Stratford upon Avon until its replacement by the current through station when Snow Hill reopened in 1987. The station building and terminus platform were restored in 2006 and reconnected to the network on 11 December 2010 by Chiltern Railways. We can operate the layout in the transition period between steam and diesel traction or in the British Rail corporate era of the late 1970’s and early 1980’s. In the former era, most suburban services are in the hands of Diesel Multiple Units (DMU) but some steam hauled trains are still to be seen. Freight and parcels trains reverse here to use the connection to the neighbouring goods depot. Later, suburban services are entirely in the capable hands of DMUs but we have imagined that the goods depot remained open so freight and parcels trains can also be seen. The Group extended our layout both length and width ways for the 2008 Scale four Society/DEMU challenge to lengthen the platforms and include one of the three wagon hoists serving the lower level of the goods depot. 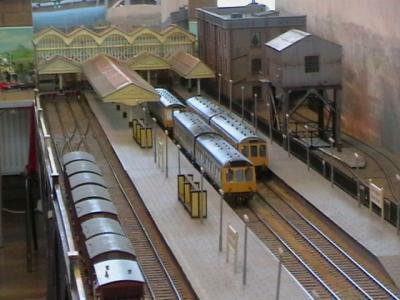 The layout has been simplified and shortened to fit the space available but the key features of Moor Street’s station building and the three platforms are modelled, including working signals of the traverser and wagon hoist. Control is by Lenz DCC or by conventional DC. Working signal operated by model aircraft servos have been scratch built by members of the WMAG as were the structures and scenic features. Brimscombe station is located on the cross country line between Gloucester and Swindon. The Cotswold town is deep in the Frome river valley to the east of Stroud. 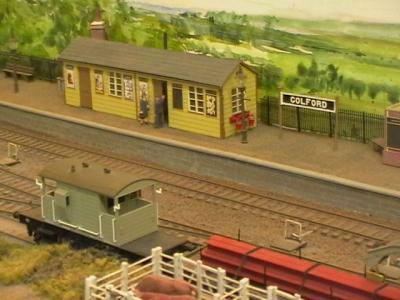 The layout includes the station area and part of the long climb up the valley out of the village towards Chalford and Sapperton Bank. Our model railway is 24 feet long by 3 feet wide, track work is Peco code 55 finescale on the viewing side and code 80 in the fiddle yard. Electrical control in conventional DC cab control but can be switched to DCC operation if we wish. Most of the buildings have been scratch built. Trains can operate using a timetable, for one of the highlights look out for the heavy freight trains on the long climb out of Brimscombe towards St Marys crossing. The Weston, Clevedon and Portishead Railway opened from Weston to Clevedon as a tramway in 1897, converted to a ‘Light Railway’ in 1899 and extended to Portishead in 1907. It allowed local residents travel between the towns without need for lengthy inland detours via the Great Western Railway. It imported coal for merchants and gas works and exported a considerable amount of limestone from quarries in the Gordano Valley. In financial difficulties from the beginning, ‘Colonel’ H F Stephens was appointed General Manager in 1911 but despite returning occasional profits, the fortunes of the line steadily declined and the last train ran on 18 May 1940. The WC&PR’s rolling stock was typically run down, second hand equipment, bought cheaply from other railways, some of which were also run by Col Stephens. 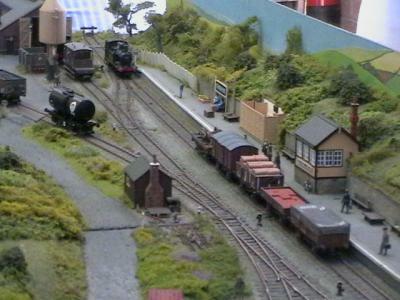 The layout is a virtually dead scale representation of the railway’s Clevedon headquarters as it was in the mid 1930s and includes the station, sheds and offices in Lower Queens Road. There were no public goods facilities at the station, these being located at Parnell Road. Nothing now remains. Stock is a mixture of kit built and scratch built items which you may have seen on my previous layout of the Weston Ashcombe Road Terminus. Coleford, surprisingly for an isolated market town in the Forest of Dean had two railway stations. The Severn and Wye Railway (S&W) wound its way up from Lydney via Parkend, arriving in 1875. This was much to the annoyance of the Great Western Railway, which arrived from Monmouth some years later. 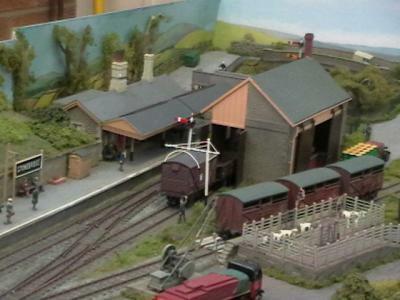 It is the S&W station which forms the basis of this model railway. Passenger traffic on the S&W ceased in 1929, but the line remained open to freight until 1967 with dispatches of free miners’ coal, daily ballast trains from Whitecliff Quarry, and receipts of general goods and household coal. 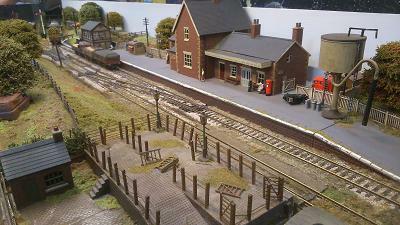 The model is based closely on Coleford and assumes that passenger services continued until closure of the line. Stock is a mixture of ready to run and kit build, and represents what actually did, or reasonably could have run on the branch during the final years. Operation is analogue and points are operated manually in prototype fashion. Harbourne is a fictitious truncated branch in the Western Region of British Rail circa 1968 to 1973, it is hanging on to survival against road competition. The station provides a sparse passenger facilities for a sparse train service. Freight is varied and the goods yard is still reasonably profitable. Some services enter and depart only using the run round at the end of the branch to access off scene industries further down the line. Motive power is wide and varied includes class 03, 08 shunters plus mainline locomotive classes 25, 22 and 35 Hymek, plus the occasional Diesel Multiple Unit. Built originally so I could show what can be done in a small space Harbourne is now ten years old and still a firm favourite at exhibitions, appears in British Railway Modelling in 2010. 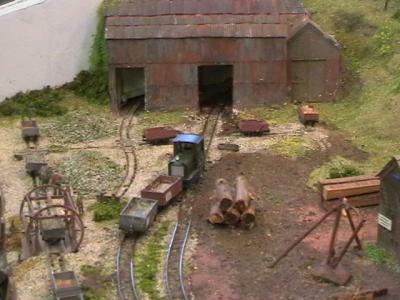 Set in the 1950’s this layout illustrates the narrow gauge clay lines that existed on the Isle of Purbeck in Dorset. Originally the lines were of two different gauges; 2 feet 8 inches and 3 feet 9 inches. Eventually the lines fell into disrepair and in the 1950’s what was left was laid to a gauge of 2 feet but sadly it all eventually was closed in the early 1970’s. 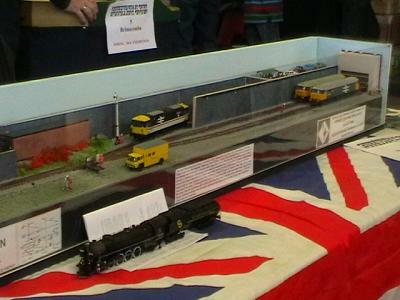 The model is not prototypically correct but features hand build models of some of the original locomotives and rolling stock including the unique two sided van and school wagon, plus also scratch built models of some of the original buildings. 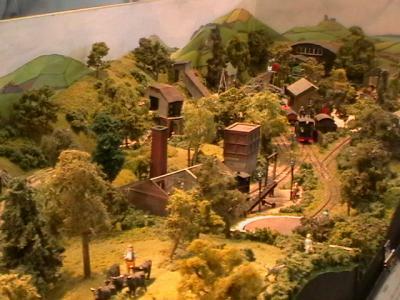 In addition to the clay trains seen on the layout, by using modeler’s license, it is assumed that the line continued west from Corfe to Kimmeridge Bay. This gives us the excuse to imagine a small station, engine house and goods shed at Norden to the north and west of Corfe and to run a selection of freight and passenger stock accordingly. All the stock is either scratch built or heavily modified kits. 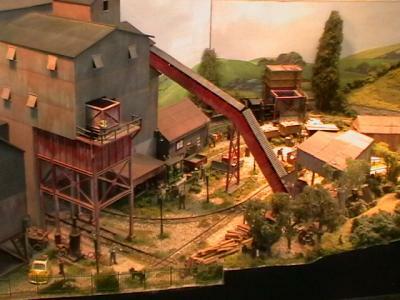 The layout features buildings with full interiors and two working turntables, a working crane and working steam shovel. 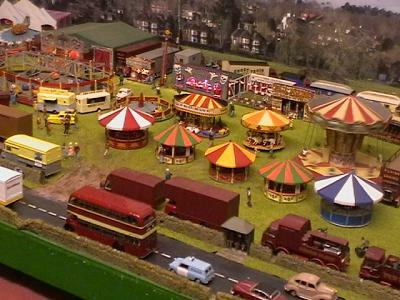 There is full lighting on the layout and the main lights can be dimmed to represent twilight over the Purbeck Hills. 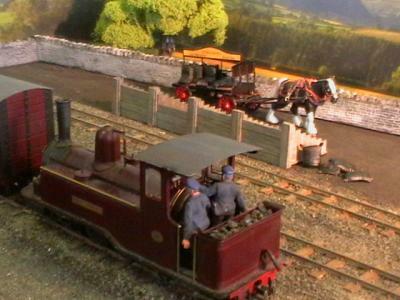 This layout portrays the two foot narrow gauge railway at Rhyd Ddu, the southern terminus of the North Wales Narrow Gauge Railways’ line to Dinas. The station was called Rhyd Ddu until the late 1880’s when it took on the name Snowdon, finally in later years it was called South Snowdon. 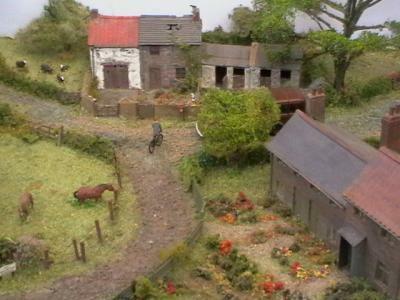 We have modelled as it is thought to have been in the early part of the 20th Century, and is largely based upon photographs and information found in the Welsh Highland Heritage Magazine. The railway was eventually incorporated into the ill fated Welsh Highland Railway in 1922. However it is now mid point of the new expanding Welsh Highland Railway, which is one of the most impressive narrow gauge railways in the British Isles. 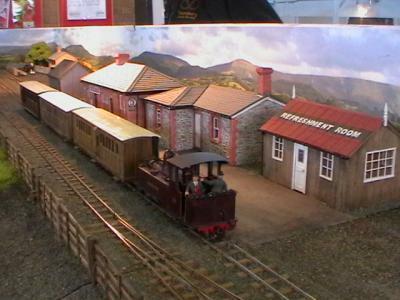 Every attempt has been made to model the station building as accurately as possible. However, it has been necessary to shorten the run round loop considerably to keep the layout down to a reasonable size. It has also been necessary to model the area around the station as it might have been, using a degree of modelling license, due to the lack of detailed photographic information away from the immediate station area. As with my earlier Dinas layout, the intention has always been to model everything virtually from scratch, and this has largely been accomplished, the unusual scale of 8mm to one foot leaving little option. The track is spiked to wooden sleepers in the prototypical manner, the ballast being produced from crushed slate. The locomotives operated on the layout were constructed from nickel silver brass, closely following the dimensions on the manufacturers original drawings. Coaches and wagons were constructed from wood, nickel silver or plasticard on nickel silver underframes. Stonework on the buildings has been produced by building up layers of Polyfilla onto a scribed plaster base, the resulting textured finish being painted in water colours. The corrugated iron for the sheds and roofs was produced from Slaters sheet, suitably trimmed and pinned. Grass is made from individual pieces of Gaugemaster grass mat together with static grass. The major structures are now fully completed with internal lighting to show the detail. There are still some areas that are being developed and this will probably continue over the next year or so. It is hoped that it will be possible to connect Snowdon NWNGR to Dinas NWNGR at some time in the not too distant future. This would be total length of 34 feet. 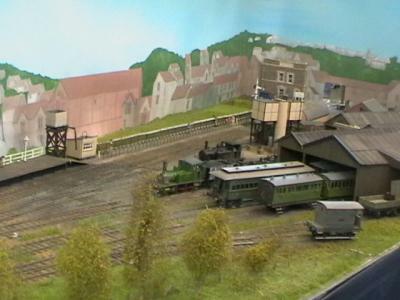 Stonebridge is the group’s first venture into layout construction using S.M.P. Trackwork. A quantity of ready made points and flexible track were purchases secondhand, glued onto cork and then ballasted with ‘N’ gauge granite ballast. Buildings on previous layouts have been scratch-built but in order to save time, kits have been used here to good effect. 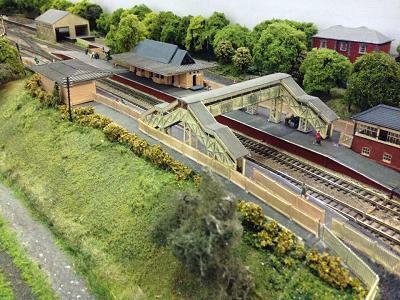 The goods shed and loco shed are modified Heljan and Airfix respectively, whereas the station building was put together without any modification at all. 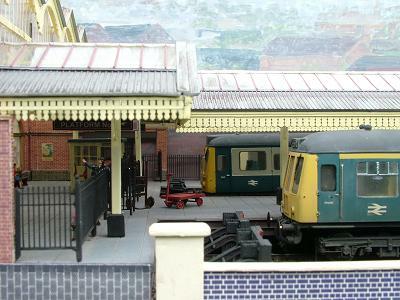 The platform mounted signal box is also Ratio and boasts a fully fitted interior. Working signals always enhance a model railway and although only two are featured here they add another dimension to the railway scene. Perhaps in the future it may be possible to have operating ground signals. 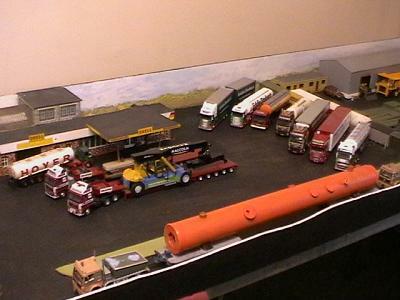 Figures bring a layout to life and these have been painted from various sources and most of the road vehicles have been altered in some way. Locos are a mixture of steam and diesel and, together with appropriate stock, trains are portrayed running in the B.R. Early 60’s period. Stonebridge is now 20 years old and was exhibited at Cheltenham for the first time in October 1987. A few years ago whilst looking at some old local maps I discovered that back in the 1890 to 1900 era there was a short mineral tramway linking two quarries at Burt Hill, near Yate Rocks, with limekilns near the Midland Railway line at Rangeworthy. There is clear evidence, a mile or so north of the Gloucestershire village of Yate that a tramway ran along Limekiln Lane. According to the Victoria County History the tramway was in operation from the late 1840’s. It is not clear how long this lasted, however it is known that the limekilns closed down around 1925. 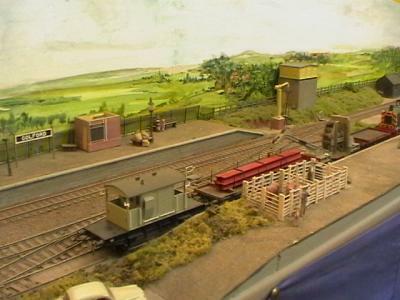 The Yate Rocks Tramway model railway is based on the premise that the tramway also linked to a stone processing plant in the area and to the Midland Railway. The tramway and works is now owned by the Gloucestershire stone company. The scene is set circa 1950 when four new diesel locomotives have been acquired. This has allowed the tramway to semi-retire the worn out and expensive to run Pecketts steam locomotives. These engines were made by the Bristol based manufacturer in 1904, originally for the Mendip Granite and Ashphalt company in Shepton Mallet they have given forty years of sterling service in Gloucestershire. 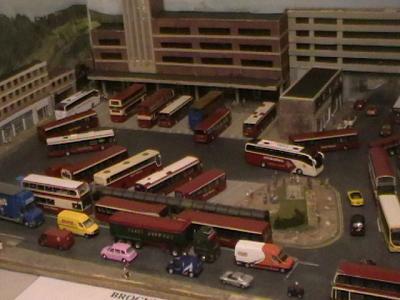 In addition, by setting the layout at this time in the fifties a Bedford OB ’Chara’ coach can appear on the layout, perhaps bringing a party from the Rail Correspondence and Travel Society. The buildings grouped together around the yard entrance are based on actual local structures. The works yard is totally fictitious and now includes disused lime kilns and the Stone Company’s new timber yard and storage shed.